During science lab, students travel back to the industrial revolution in England to study natural selection among moths. Gabby Carr leaned close to the lab table, counting out grains of rice. 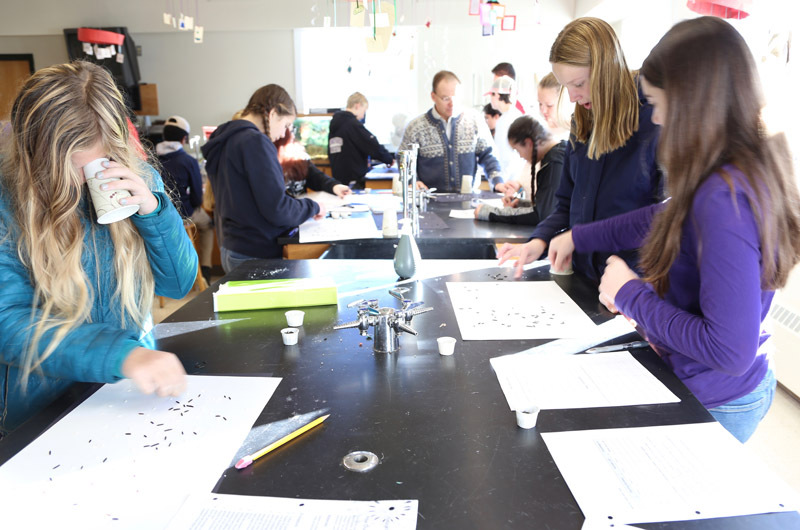 She and her partner, Maria Frangos, were separating out 50 black rice grains and 50 white rice grains for a lab about natural selection in their eighth grade science class at the West Tisbury School. They shared a lab table with Emily McKinney and Eleanor Hyland who were also counting out grains of rice. “Who are the birds going to be?” asked teacher Karl Nelson. “Who are the moths going to be?” he asked. The class was embarking on a lab that would replicate the change in the peppered-moth population around Manchester, England in the mid-1800s. A sheet of white construction paper represented the area prior to the industrial revolution while a sheet of black construction paper represented the area after the industrial revolution began. White grains of rice were the lighter colored moths and black grains of rice were darker colored moths. Theoretically, the experiment would show that light colored moths were more likely to survive and reproduce prior to the industrial revolution, but once increased coal production covered their environment with soot, the darker colored moths would have a better chance of surviving due to their ability to blend in with the trees and escape hungry predators. The lab fulfills the state frameworks for eighth grade life science, specifically biological evolution. Actually, it does a lot more than that. 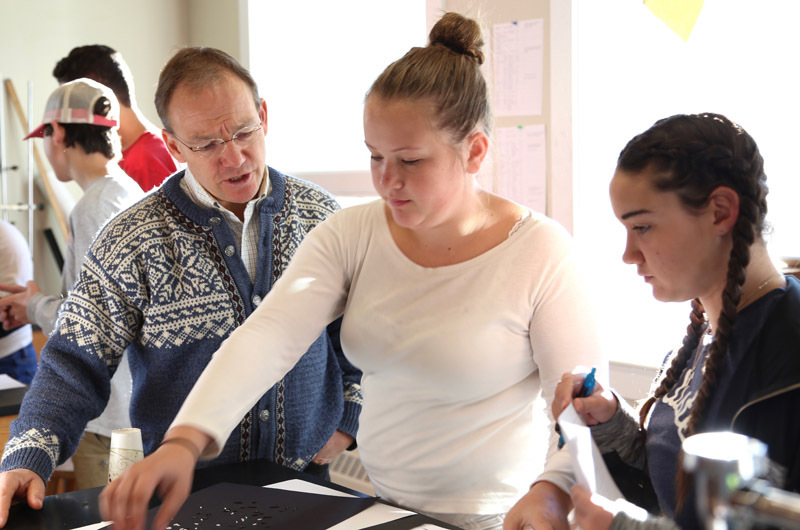 On the 2016 Science and Engineering/Technology Massachusetts Comprehensive Assessment System (MCAS), the West Tisbury School eighth grade achieved a rating of 92 per cent proficient and higher, the third highest percentage in the state. The state average for the science MCAS is much lower, at 41 per cent proficient and higher. But 2016 wasn’t the only banner year for science scores at the West Tisbury School. The science MCAS is taken in fifth and eighth grade and the up-Island district has a long history of high achievement, specifically in the eighth grade. Principal Donna Lowell-Bettencourt credits the success to passionate teachers and a foundation of hands-on learning from kindergarten onward. The engagement that a science lab allows, along with the dedication of the staff and support from the community, all come together to great results, Ms. Lowell-Bettencourt added. The eighth grade science class is lab-based, with all the work stemming from hands-on projects. 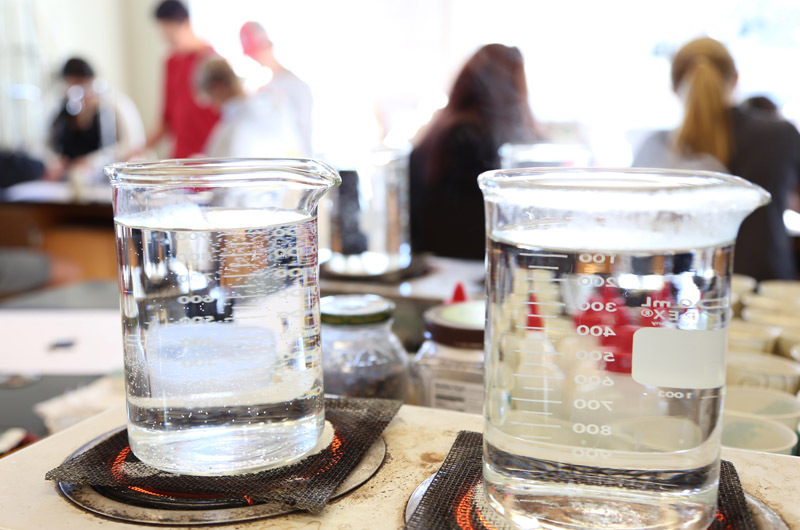 On two prep tables, Bunsen burners heated beakers full of a clear substance in preparation for the next period’s seventh grade science class. An aquarium housing a goldfish sat next to a tank holding a bird’s nest. Mr. Nelson walked around the room, providing a helping hand to those who needed it, and pausing to give the class general advice, sometimes scientific, other times practical. Maria Frangos said that the lab-based learning helped her learn, pointing out that a lot of kids have short attention spans. “It’s better to have labs where it’s more hands-on and thinking, instead of just listening, where you don’t think that much,” she said. Eleanor Hyland described another recent lab where students extracted their DNA by swabbing their cheeks, and then examined the strands under a microscope. The students didn’t finish the lab in the 50-minute period, which is common. Labs often stretch over numerous days, and include prelab work and data crunching. Yet during the limited time, while they pecked at the rice and faced the consequences of natural selection, the students were light-hearted and boisterous.